To start dough, combine flour, salt, and cinnamon in a large bowl. Add cold butter and cut it into flour using a fork or your fingers until butter is in small balls and evenly distributed in flour. Add yogurt, lemon juice, and water and bring dough into a ball. Wrap the ball in plastic wrap and store it in the fridge for at least an hour. For filling, add all filling ingredients to a medium pot and bring to a simmer. Turn heat down to low and simmer for about 15 minutes. Turn off heat and let filling cool for 30 minutes in the pot. This allows all the fruit and raisins to absorb liquid. Drain filling in a colander. To make a pie, roll dough out into a large rectangle. The dough should be about 1/8 inch thick. Use a bowl to cut out 6 inch circles in dough. You should get four, then you can re-roll the dough and get 2 more. Take a dough circle and roll it out a bit more until it's 8 inches across. Then add about 1/4 Cup of filling to the bottom half of the pie. Mix egg wash by scrambling an egg with a tablespoon of water. Brush egg wash around the edge of the pie. 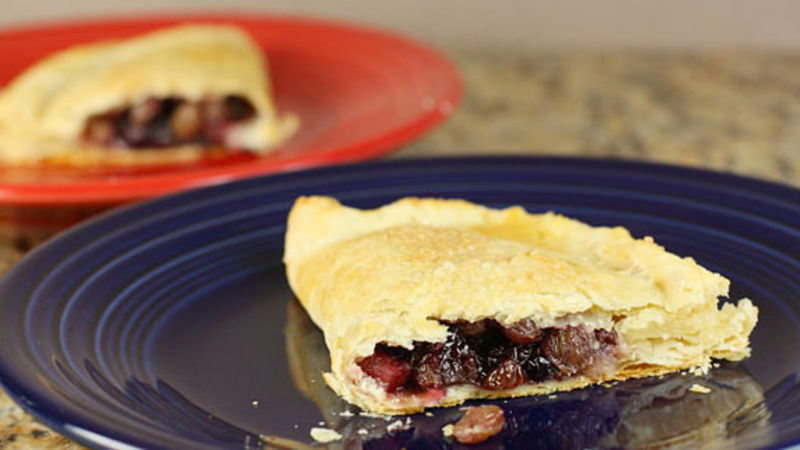 Fold pie over and push out any air in the filling. Crimp the edges to make sure they are sealed. Poke holes in the top with a fork. Finish all the pies, then brush them all with egg wash and sprinkle with coarse sugar if you want. Bake pies at 350°F for about 30 minutes or until they are golden brown. Let cool for 5 minutes before eating. If you aren't familiar with mincemeat, it's a traditional English pie that's usually served over the holidays. It usually involves suet, which is the fat from around the kidneys of a cow. Needless to say, it's pretty hard to find suet these days in the grocery store. Not very popular. Luckily, you don't really need meat to make a good mincemeat filling. Since most of the flavor comes from a variety of fruits, spices, and booze, you can still make a really good, unique filling and leave out the meat. While you could make this in a full pie, I think the filling works better in smaller pies. The filling is pretty sweet, so having more dough helps even out the sweetness of the filling. The dough for this recipe is one of the easier ones to make. Because the filling is so sweet, I added some lemon juice and tangy yogurt to the dough, which makes it a bit tart. It pairs great with the filling and the extra liquid makes the dough pretty easy to work with. To make it, mix up the flour, salt, and cinnamon in a bowl and cut in the cold butter using your fingers or a fork. Then add all the liquid and stir it together. Once the dough is starting to come together, turn it out onto a counter and press it into a tight ball. Wrap this in plastic and store it in the fridge to chill for at least an hour. On to the filling. Traditionally, mincemeat has some ingredients that are kind of hard to find these days so this is my modern spin on it, which uses pretty accessible items. I also like to add some triple sec and brandy to my filling. If you don't have those, you could leave out the brandy and substitute orange juice for the triple sec. Bring all these ingredients to a simmer in a pot over medium heat. I added my apples last just so they don't get too mushy. Once it's simmering, turn the heat down to low and let it simmer for about 15 minutes. Then kill the heat and let it cool in the pan for 30 minutes to let the fruit absorb all those juices. Next, strain the filling in a colander. You don't need all that liquid in the pies and the fruit has absorbed a lot of the flavors by now. When you're ready to make the pies, roll the dough out into a large rectangle that should be about 1/8 inch thick. Use a bowl to cut 6-inch rounds of dough. You'll probably have to re-roll it once to get 6 pies. Take one circle and roll it out a bit larger (8 inches maybe) on a lightly floured surface. Then add about 1/4 cup of filling to the bottom half of the pie. Don't put the filling right in the center or it'll be hard to fold over. Brush some egg wash around the edge of the pie and fold it over. Crimp the edges of the pie, then poke some holes in the top with a fork. Finish all the pies and then brush them with some egg wash. Sprinkle the pies with coarse sugar if you want! Bake these at 350 degrees for about 30 minutes or until they are a nice golden brown color. Let them cool for a few minutes before eating! These turned out delicious. The filling is pretty sweet but has great spicy flavor and a nice texture. Trust me. You won't miss the suet! Nick is working on a mincefruit pie recipe that contains nothing but meat. Check out his other creations on his blog, Macheesmo and on his Tablespoon profile.